Anthony Westkamper Polyphemus moth perched on my neighbor’s hand. 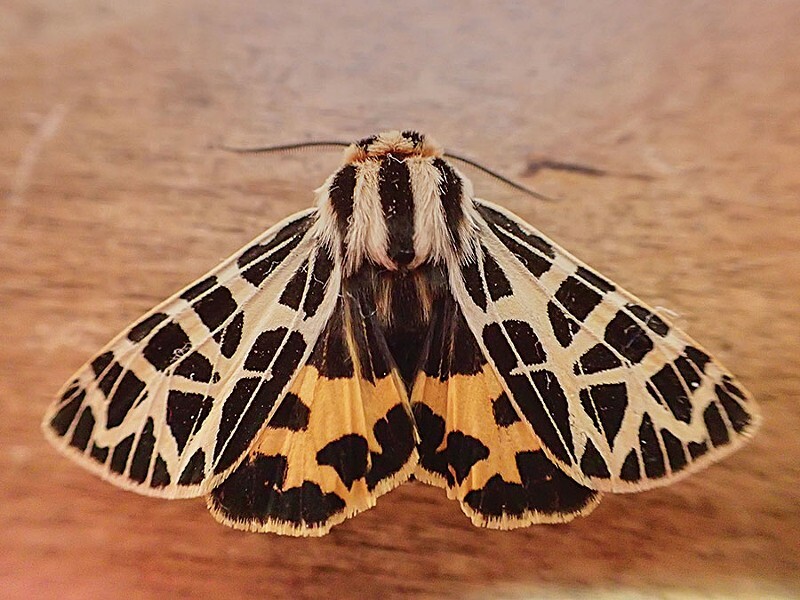 Anthony Westkamper The day-flying ornate tiger moth. When I think the word "moth" I think of something gray. There are brightly colored day fliers but the nocturnal majority are gray or brown, patterned to blend in with tree bark where they rest during the day. One of the things that makes moth identification challenging is that there are often different versions of the same species. This can be important. In England there are two different varieties of the peppered moth, one darkly patterned and a lighter version. Specimens taken from before the Industrial Revolution were predominantly the lighter type. Following the heavy burning of coal, which produced soot that blackened tree bark (and everything else outdoors), the darker type became predominant. Following the cleaning up of the exhaust, the lighter kind made a resurgence. Presumably the lighter ones were better concealed from predatory birds when the tree bark was cleaner and the darker were a better match on dirtier trees. This study and conclusion was at one time refuted, and has since been reinstated as a sterling example of Charles Darwin's Theory of Evolution. Not only is this an example of evolution in action but it shows that mankind's actions in the world effect wild populations in subtle ways. I wonder how many species of moth have had their lives disrupted such that their lines were extinguished merely by front porch lights and street lights left on overnight. From the preponderance of light-colored moths I've found lately, I gather our air quality is pretty good. Sunday night around 11:30, when I checked the light trap in my back yard, I was amazed to find a moth with a body as large as the first two sections of my finger and narrow wings like a hummingbird. I recognized it immediately as one of the Sphinx moths, although I didn't recognize the species. It was gray, black and white. Then my neighbor called about a moth with a 5-inch wingspan. The clear wingspots on the front wings of her visitor told me this was a polyphemus moth (Antheraea polyphemus), a species I'd read about but never seen. 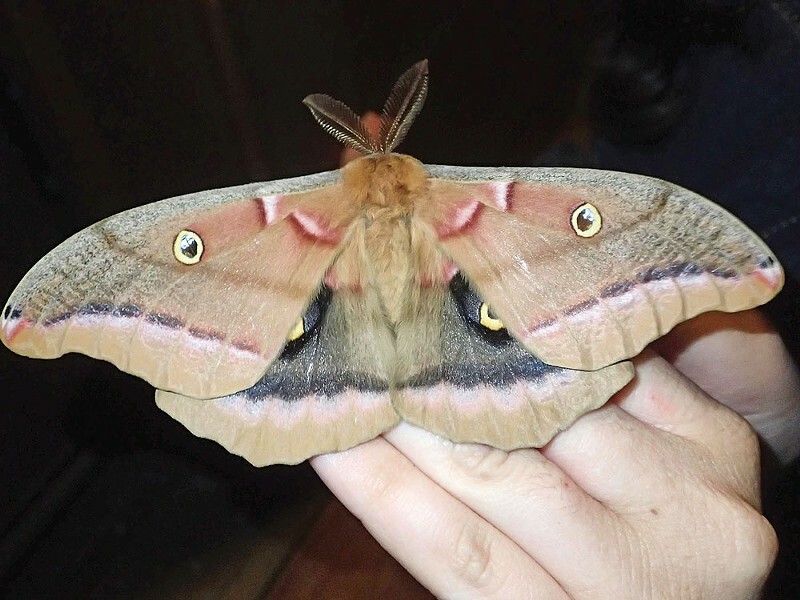 Both the ceanothus and polyphemus are members of the family saturniidae, or giant silkworm moths, which includes some of the largest moths in the world. This one was easily as large as a small bat. They are beautiful and harmless creatures, lacking even mouthparts with which to feed. They do all their eating and growing as caterpillars, and after metamorphosing into adults they have one task only: seeking a mate to perpetuate the species. This one was a male. You can tell by the luxuriously ornate antennae that they use to follow the pheromone trail of the female. The next morning, it was still on the porch. When gently prodded, it flared its wings to display the eyespots on its hind wings. Entomologists believe this may act as an alarm response to frighten potential predators. I was concerned this specimen might have exhausted its limited energy reserves, but it took wing and flew gracefully into the surrounding woods to pursue its destiny. I spent some time with my moth books and online resources, and came to the conclusion the moth in my yard was the "elegant Sphinx moth" (Sphinx peregelegans). Although not closely related, these moths are both named for mythic creatures. The larvae of the Sphinx family (sphingidae) rear up striking a Sphinxlike pose when threatened. Polyphemus is the name of the cyclops blinded by Odysseus in Homer's The Odyssey because of those transparent eyespots on its wings.